Joan Polishook is a plein air artist whose work includes scenes of the rural countryside with an emphasis upon old barns, wooded sites, rolling hills, fields and water. She’s also an author of two books, and a long-time supporter of the arts. 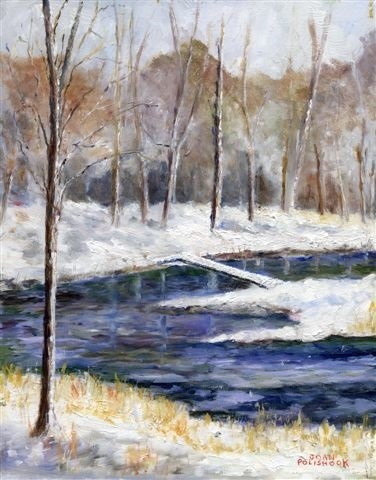 Her work is on permanent display at the Grey Towers NHS in Milford, PA and the Dorflinger-Suydam Sanctuary in White Mills, PA.
Joan’s original oil paintings range in price from $200 and up. The Artists’ Market is currently offering several of Joan’s favorite framed original oil paintings.